Our quick easy chicken recipes includes this healthy recipe, Mediterranean Chicken. This is a favorite for the family as it's tasty and full of vegetables and meat and a favorite for me, as it's done in one fry pan. I love this dish for its efficiency! I cut up the vegetables while the meat's cooking. So, within 15 minutes, it's all in the pan and after 30 minutes cooking it's ready for the table or for freezing. 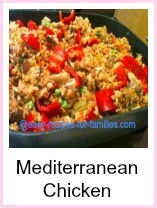 This is a one pot dish, complete with carbohydrates in the rice, protein in the meat and vegetables. • Add piri-piri, if you'd like this with a little bite. Otherwise omit this condiment. 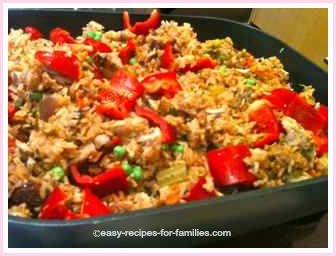 • When the rice is cooked and 5 minutes before serving, stir in peas and capsicum. Turn off heat, cover for 5 minutes. The heat from the pan and meal will cook the peas and capsicums without overcooking them. This tasty meal is ready to be served. 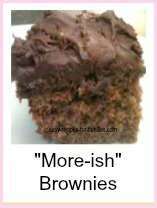 It's prepared within 15 minutes and cooked in 30 minutes. It looks colorful and inviting and tastes sensational! Now, how easy was that! You've turned out a healthy meal in under half an hour. I use a large electric fry pan for my healthy one pot meals so as to avoid or minimize the use oil in cooking. Further, the large fry pan means 2 meals can be cooked at the one time. It's just as quick to cook two meals as it is to cook one - it's just time and cost efficient to cook in larger quantities. Chicken thigh meat is best for this dish as it is more robust than breast meat but be sure to remove all fat from the meat before cooking. Healthy cooking for us means using less saturated fat and I take the trouble to cut away bits of chicken fat. 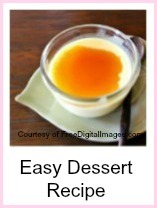 My family loves healthy recipes and I hope you too will enjoy our quick easy chicken recipes. Remember the key to healthy meals is quick cooking and not overly processed meals. 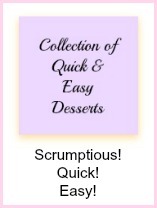 Leave Quick Easy Chicken Recipes to be inspired by hundreds of delicious healthy recipes!